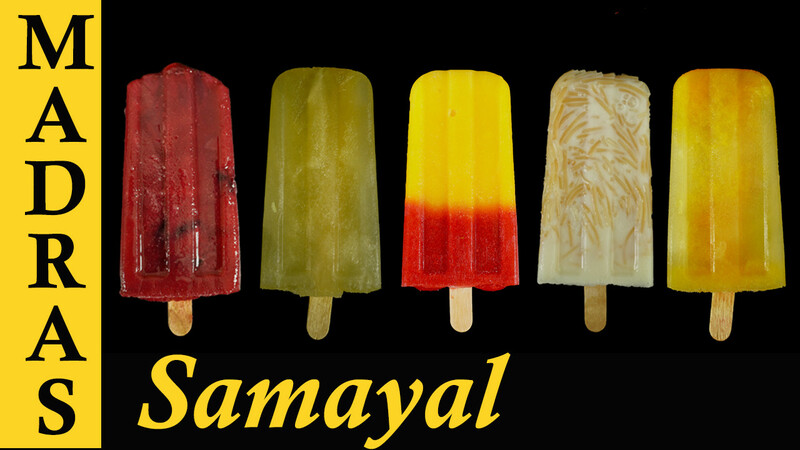 As hot summer is approaching lets's beat the heat with this awesome five delicious cool fruit Popsicle, this can be made quickly and is free from sugar and preservatives.This is my favorite summer drink because its both tasty as well as refreshing. I have shared 5 basic popsicle recipes Mango Strawberry Ice, Grape Ice, Orange Ice, Semiya Ice and refreshing lemon Ice which can be made in a blitz. Into a blender add the mango chunks and grind it smooth. If you like sweet or if you are serving to kids please use sugar for extra sweetness. Once done transfer it to a ice mold. To get nice contrast i have used pureed some strawberry and topped over mangoes. Add grapes to a pan and cook it with some water. Once the grapes are nice and soft add sugar and cook until it turns hick (syrup consistency) . Turn off the heat and let it cool. Now to a blender add some seedless grapes and grind. Pass it thought a filter and transfer it to a Popsicle mold. Squeeze juice out of 4 oranges and add some honey or sugar to sweeten the juice. Transfer it to the mold and set aside. Into a pan add milk and semiya, cook until the semiya is soft and tender. Finally add sugar and cook for few more seconds. Once cooled transfer it to the mold and set aside. Squeeze juice out of 2 Lemon and add some honey or sugar to sweeten the juice. Transfer it to the mold and set aside. Freeze it for 4 - 8 hours and our refreshing ice are ready to be enjoyed.